If you are a regular reader you are probably well aware of the pain I suffer from day to day. If not....well I have a lot of pain.lol 12 years ago I got into a car accident and broke my back and neck in 4 places. Needless to say there is pain :) and the winter months are by far the worst. Any time I get a chance to try a new pain cream I am sure to jump on, you never know when there may be something out there that is more helpful them the last. 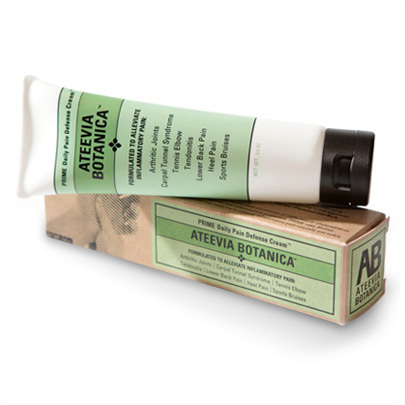 Recently I came across a review opportunity for Ateevia Botanica's PRIME Anti-Inflammatory Cream. The first thing I noticed was the smell, it wasn't gross, which is good because my husband laughs a lot about smelling like an "old man" as my husband would call it. I really should have thought about it before I put it on because it had been sitting in the mailbox.....outside....in the cold! However once it was rubber in it was great. I sat and waited for the "burning sensation" but was pleasantly surprised that there wasn't any. It really seemed to loosen up my tight muscles as I slept :). All together it seemed to work well with little smell and burning so it gets an A in my book. I am so sorry, I thought my hip pain was bad and like yours the cold makes it so much worse. If this works for you, I need to try it. It would be nice to walk with less pain. I hope this stuff can help you out more!